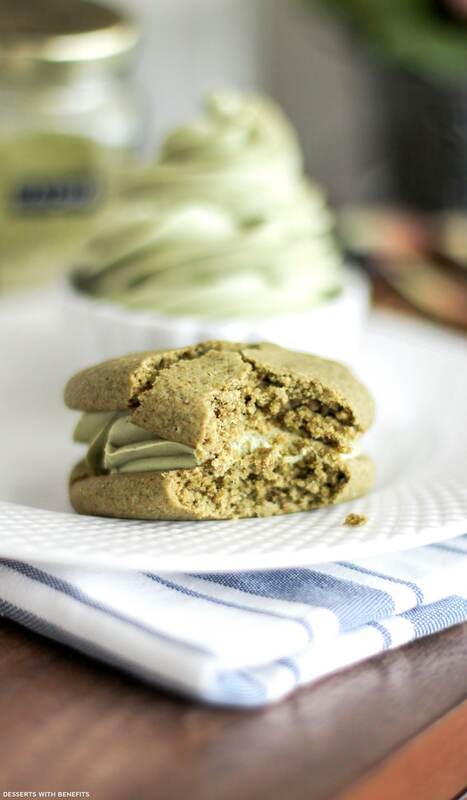 These super unique and sweet Healthy Matcha Green Tea Sugar Cookies are packed with that classic matcha green tea flavor. And the texture? It’s heavenly. They’re soft and chewy, just like storebought sugar cookies, but without the refined flour, butter and sugar! Would you ever guess that these cookies are sugar free, gluten free, dairy free, vegan, and whole grain?? Nopity nope. With every bite, mind = blown. My dad, who literally could not care less about desserts and sweets of all kinds (HOW ARE WE RELATED??? ), ate one of these cookies and loved it. He immediately asked for a second. For real, I thought I was dreaming. These cookies are absolutely scrumptious, and you need to make a batch ASAP. Matcha! Cookies! Matcha Green Tea Sugar Cookies FO’ LIFE YO! 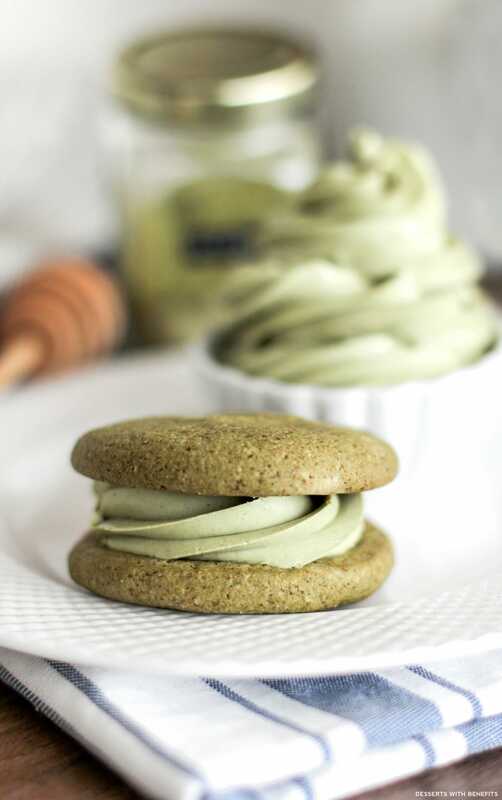 These Healthy Matcha Green Tea Sugar Cookies are secretly good for you! They're sugar free, gluten free, whole grain, eggless, dairy free, and vegan too! In a medium-sized bowl, whisk together the oat flour, erythritol, matcha, baking powder and salt. In a large bowl, whisk together the coconut oil, almond milk, vanilla extract, butter flavor, stevia extract and almond extract. Dump the dry ingredients over the wet ingredients and fold together. Fold until the mixture can form into a dough ball (it will look sticky at first, but then the oat flour will absorb the liquid and turn into a play-doh/cookie dough texture). Use a medium cookie scoop to portion out the dough onto the prepared cookie sheet. Roll the dough portions into balls, then use your fingers to press them into patties. Form them just a tiny bit thicker and smaller than you prefer your cookies -- they spread out a little. Bake for 12-14 minutes, or until baked through (when you tap the center of the cookie, it should be soft, but shouldn't leave a permanent fingerprint indentation). Slide the parchment paper off the cookie sheet and let the cookies cool. Serve immediately, or transfer them to a freezer bag, seal tightly, and store in the freezer for up to one month. For a "freshly baked" cookie straight from the freezer, place a cookie on a plate and microwave for ~20 seconds! I would make the Classic Cheesecake first! I have some of the matcha powder but could use some of the other ingredients to make these beautiful cookies. 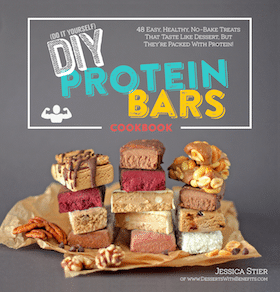 Thanks for the chance to win them or your creative cookbook. Congratulations Jessica! This new cookbook looks amazing. Fudge would be first on my “to bake” list. AH! You finally published this recipe on your blog! I want to make these. So, my question is, do you think I could use stevia in place of the granulated erythritol? Or would sugar (or brown sugar) be a better replacement due to it being granulated? 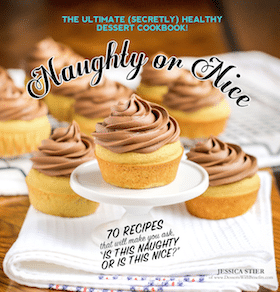 Oh, and you know I’d make that banana cream pie first and foremost if I got my hands on one of those Naughty or Nice cookbooks. 🙂 PIE! 1) What kind of stevia do you use? If it’s liquid, it won’t work, but if it’s like a stevia-erythritol mix, it might! You’ll just need to adjust the sweetness using a conversion chart. 2) Do you want to sub the erythritol because you don’t like it or because you don’t have it? If you want to use regular sugar, that should work just fine. I just wouldn’t use brown sugar because it might mess up the final color. In these cookies, for one, you can replace the almond milk with any other milk, like organic dairy, soy, hemp, coconut (if you’re not allergic), etc. I feel like there’s no good replacement for the almond extract, so you can just omit it. Maybe replace it with more vanilla extract? I’d love to try making my own sprinkles! I love how they look but want to make them healthier! I would make the peppermint coins first!! Yum yum! I want try making the oatmeal raisin cookies!!! I love oatmeal! I’d make red velvet cake for sure! All your recipes looks so yummy! i would make the pop tarts! I’d make peanut butter pie. I LOVE that stuff! Hi! I think I will try to make the chocolate cake and the chocolate chip cookies. 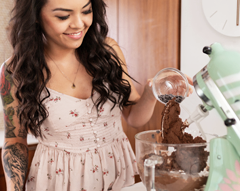 I know that they are the “classics” desserts, but I will be making the cake for my dad and I just have something with cookies, I will love to make them healthy! I’m suuuuper crazy for carrot cake, so I’ll probably try that one out first!!! I’d make the Healthy Pumpkin Pie recipe first! I looove pumpkin and your recipe sounds delightful! I know where I can get some matcha very easily, so it would be interesting to do a variation on the sugar cookies! I would love to try the Chocolate Cake recipe. I can’t eat gluten so when I found your website I was really happy. You had me at matcha cookie BUT I just died when I saw it was a sandwich cookie. So….what is sandwiched between the cookies in the picture? I can’t wait to find out if I have everything I need & hopefully make these tonight!! 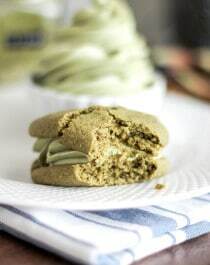 Any way to make these matcha cookies nut-free for those with allergies? Do you think you milk would work as a good substitute and coconut or rice flour instead of the almond products? I was wondering about the Lorann Butter Bakery Emulsion. I bought some and read the ingredients and it says it contains “natural flavoring” which would imply it is derived from butter. So it can’t be considered vegan, can it? If you want soft and chewy cookies, you’ll need the coconut oil. 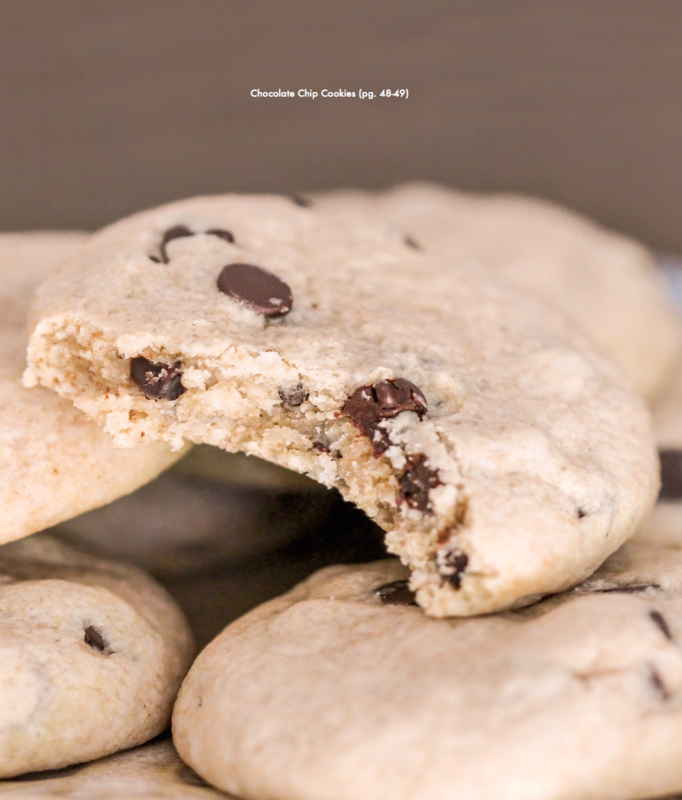 Fat and calories aren’t anything to be afraid of, and even with 130 calories per cookie, you can eat 2-3 without feeling guilty (especially when typical chocolate chip cookies can contain up to 450 calories each)! I suppose you can substitute ~2-3 tablespoons of the coconut oil with applesauce, but I haven’t tried it. The cookies may turn out slightly cakier and less dense and chewy.